Hello there! We made it to Austin and are trying our best to get settled. Our apartment, which is in a brand new building, isn't ready for us just yet, so we're half settling in at another apartment and only unpacking what we need for the time being. It's not ideal, but we feel fortunate to have a home -- even if it's just a temporary one. 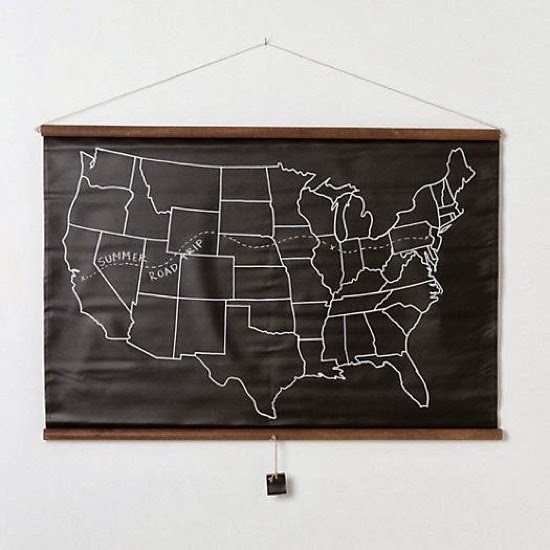 In the meantime, I'm searching for decorating ideas and this canvas chalkboard map caught my eye. I'm already picturing little hand-drawn hearts on all the places we've lived. I love this! I've been looking for an old map like this for Emma's room, but this seems like more fun. Love this map!! Glad y'all made it safely! Love this map! Glad you made it and I can't wait to hear all about your adventures!